On 18 August 2018 the North-West University’s (NWU’s) Student Representative Council hosted the inaugural Mr and Miss NWU pageant at the NWU’s campus in Mahikeng. With Sam Junior Mbatha serving as the official master of ceremonies, it was a night of glitz, glam and music. The audience, including various members of management and students from all three campuses, were treated with performances by the NWU Dance Club, traditional dancers and the NWU DJ society. The event saw six winners from the three campuses battle it out for the much coveted title of overall NWU king and queen. 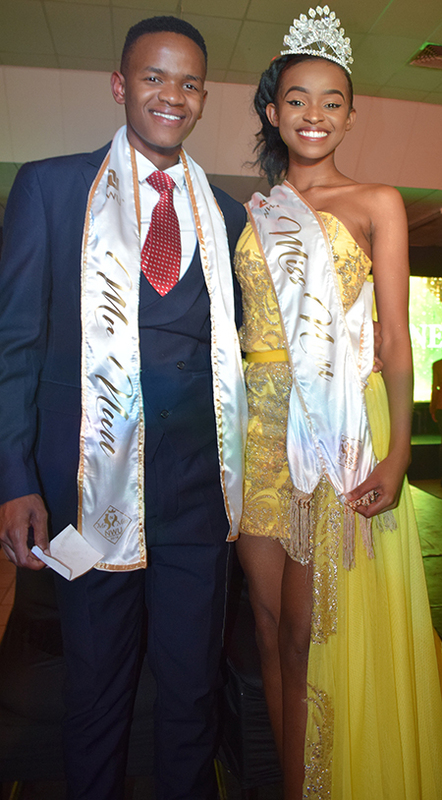 Taahirah Zungu and Lwazi Jakuja walked away with the spoils and were crowned Miss and Mr NWU. “My ambition is to inspire my peers and young models to be the best that they can be,” she added. Lwazi is currently a third-year student in the BCom Economics and Risk Management Extended Programme on the campus in Vanderbijlpark. He is also the deputy chairperson and acting chairperson of the NWU Fashion and Art Society. Lwazi is an aspiring model, public speaker and entrepreneur in the making. These are desirable titles indeed – not only are the winners the faces and ambassadors of the whole NWU, but they will also champion charitable causes for a year. Our Mr and Miss NWU each walked away with prize money to the value R10 000, the first runners-up got R5 000 and the second runners-up each received R3 000. All the participants also received a R2 000 voucher from Corporate Relations and Marketing to purchase branded items from one of the NWU clothing stores. Meet our Mr and Miss NWU: Lwazi Jakuja and Taahirah Zungu.